Grunfeld’s dismissal was announced with four games left in a disappointing, no-playoffs season that began with Leonsis setting a goal of 50 wins, something the franchise last accomplished in the 1970s. Instead, Washington is 32-46 and in 11th place in the 15-team Eastern Conference. 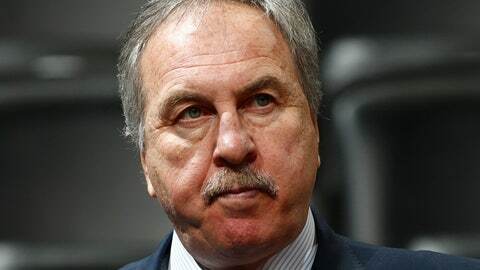 So Grunfeld is gone, after sticking around through years of fans’ complaints about him. “Each year that he worked for me, we sat down and said: ‘What are our expectations. What are our goals?’ And we’re very, very thoughtful and mindful and spend a lot of time on what the goal should be. We set that up this year and we didn’t meet them and so that’s what happened this year,” Leonsis said. Leonsis, whose Washington Capitals hockey team won the Stanley Cup last season, referenced that franchise’s GM change that came four years before its triumph. But Leonsis made clear that he didn’t accept the injuries as an excuse for the way the season unfolded. He plans to enlist an outside firm to help with his next moves. Tommy Sheppard, senior vice president of basketball operations, will take over Grunfeld’s duties on an interim basis and will be a candidate to replace him permanently. The club went 568-724 during Grunfeld’s tenure, including eight postseason appearances. But Washington never made it past the second round of the playoffs, despite having All-Stars such as Wall, Bradley Beal, Gilbert Arenas, Caron Butler and Antawn Jamison. Otherwise, the cupboard is rather bare, and because of the large contracts Grunfeld gave Wall and Beal — not to mention backup center Ian Mahinmi, who rarely plays — there is not a lot of money available to bring aboard top-level free agents.